Well, girls. After a bit of a delayed journey, we have finally come to the last chapter of Spectacular Sins. I can’t even begin to express how slowly digesting this book together with you has bolstered my faith in our sovereign and trustworthy God. To use Piper’s terms, the weighty doctrine presented in this smallish volume has been steel to my spine and silk to my soul. May God give us wisdom to discern where on the spectrum of hard and soft, of cunning and innocence, of strength and vulnerability we should situate ourselves in every single circumstance we face. Today’s chapter deals with the murder of Jesus – the most spectacular sin of all. I’ve decided in ending our discussion to note a few of my favorite quotes and let you remark on those. I’m sad to see this end, but it’s unavoidable so let’s get to it! Question: What practical ways have the truths of this book strengthened your own faith? Can you describe any situations which have brought SS to mind as you’ve dealt with them? Question: Can you pinpoint a time in your life when you’ve fallen prey to a Judas – or worse – when you’ve been a Judas yourself? Question: Understanding first of all that I am in no way saying anyone could ever suffer the agony Jesus suffered, can you describe either a personal experience or one of which you are aware that could qualify as an ugly death? I’m asking this question symbolically though I realize some of you may have been touched by this literally. If the death was symbolic, have you yet seen the resurrection? If the death was literal, what strength do you gather from knowing a resurrection is coming? Question: Describe any fresh insights you’ve gained on God’s involvement in Jesus’ death. Question: This statement makes me think of Heath Ledger’s Joker in the last Batman movie. A mind set on madness. And not because he is delusional enough to believe he can ultimately win, but because as he unravels, he wants to take as many with him as possible. How can viewing Satan from this perspective open our eyes to whose side we are on when we grumble against God? Have you ever blamed the wrong person for your misery? I would like to leave you with a portion of Piper’s closing prayer for us, the readers. Because I can’t say it any more beautifully, I’ll hope he won’t mind if I adopt to pray it for you as well. Blessings on each of you who participated and thank you for seeing this Book Club through to completion! Also, many thanks to Missy without whose partnership I wouldn’t have dared attempted such a thing. I love you, friend! the glories of Jesus Christ. let there awaken new affections in our hearts. that this is what it needs more than anything. All this freedom, Lord, we see for the sake of love. Hi Lisa~ I just wanted to thank you, Missy, and the other ladies who participated in this study for sharing your insights. I could not study the book right now (will do it this summer) but have been truly blessed by all you ladies have shared. I can’t wait to dig in for myself in a few months. Blessings to each of you – you’ve all been a blessing to me! 1. This book has been a great reminder of the fact that God is in control. Particularly at this time in history, with all that is happening in the world and in our country and with the political and economic climates in which we live, this assurance gives me peace. I know that God is not only allowing difficult or evil things to happen, but they are all a part of His master plan. He is not scrambling for Plan B in response to the evil in the world! 2. In terms of thinking "have I been betrayed by a friend or loved one? ", nothing specific comes to mind. But I do think that we all become a Judas anytime we "play church", put on our masks, and are a "convenient Christian" or do things for show. And anytime we show preference or allegiance to those who are "prominent Christians" in order to better our standing or reputation. we are considered as sheep to be slaughtered." No, in all these things we are more than conquerors through Him who loved us. Whew! That was a spectacular study! Thanks, Lisa & Missy! Will you be choosing another book to read? I missed out on this book club and would like to participate in one. It was a fantastic, thought provoking, faith building read. Thanks for providing the necessary impetus; I am the better for it. 2. The closest “Judas” examples I can think of is when some friends at church were having an affair while continuing to lead Bible classes and participate fully in other church roles. Happy to report, though, that they repented of it, and so far both marriages are still intact. I’ve felt the agony of death when I was pregnant with my 2nd child and discovered she had developed physical problems. The roller-coaster ride that ensued for the next few months ended with her dying one hour after birth. For awhile the only strength I had was knowing that God would reunite us one day in heaven, for all eternity. Eventually I was able to receive the strength he was supplying from other places as well. 4. For some reason, reading this section on God’s involvement in Jesus’ death had a strong effect on me. I’ve thought of his involvement before, but the way that John Piper worded it, made it all seem so critical to my faith. I really appreciate how he writes with such clarity and urgency. 5. I’m not sure I’ve categorized Satan as “irrational” before—I’ve probably given him more credit than he’s due about being “smart” in the way he tempts us. But I like this insight! I think it will help me see the futility in temptations even more so. I blogged about this powerful chapter here and here. Thanks SO much, Lisa and Misty, for organizing this study. I have really benefited from reading the book more closely than I would have on my own, and from reading the comments of the other ladies. May God rain big blessings on you all! Even though it has been over a week since the last set of questions were posted, I still wanted to post my answers because, well, because I finally got them done. :) I also wanted to say thanks to Lisa, Missy and all those who have participated in this study. I feel honored to have done this with you. 1. The truths of this book have strengthened my faith of God’s sovereignty during all situations. 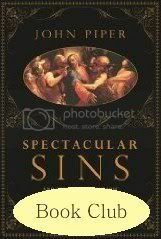 The current economic crisis has brought “Spectacular Sins” to mind more than once over the past several weeks. 2. No specific time comes to mind of a time I have fallen prey to a Judas, but there are many small ways this could play out in our lives without us realizing the power behind it. Piper said that Judas loved the power and pleasure money could bring. Anything that provides power (attention) or pleasure (praise) can eventally cause us to fall prey to this deception even temporarily if we are not prayerfully aware. 3.Symbolically, for me it would be the issue of my weight. I take 2 steps forward and 3 steps back and this has been the battle of most of my adult life. Satan has kept me from having peace about my weight or from making any real progress towards conquering this battle. I know there are many more tragic situations that people are dealing with, but when the enemy can keep us consumed with any thing other than what we should be doing in God’s service he is dragging us along with him away from our intended purpose. In this battle, he keeps me or at times has kept me from enjoying family, job, and friends. He can keep you so busy trying to overcome one battle that you are not giving God you best. The enemy will do and use anything in our lives that he can to drag us away from our intended purpose. 4. Mainly, an affrimation (that is so hard to comprehend) of how much God truly loves me! 5.The concept of Satan’s acts most often being senseless may help me to focus sooner on who is behind such struggles. I spend to much time trying to “figure” things out.